Multi-Gyn FloraPlus is effective in the treatment and prevention of (recurring) vaginal yeast/ thrush problems. It alleviates discomforts such as discharge, itch, irritation, redness and sensitivity. Note: if you leave a review it will be anonymously. We will not show your name or emailaddress. This is really good stuff. Multi-Gyn floraplus is the best vaginal treatment I've ever used!! When will I feel the effect? It differs per person, but you can feel a relief of the symptoms immediately. Do I have to use it for 5 consecutive days? Yes, we advise you to use the 5 tubes for the best effect. Does Multi-Gyn FloraPlus have any side effects? No, there are no known side effects. Why is Multi-Gyn FloraPlus different than other vaginal yeast/thrush treatments? Multi-Gyn FloraPlus has a direct effect on the symptoms and is a natural product which doesn’t negatively affect the vaginal flora. Multi-Gyn FloraPlus will help the good bacteria grow and diminish the growth of candida. 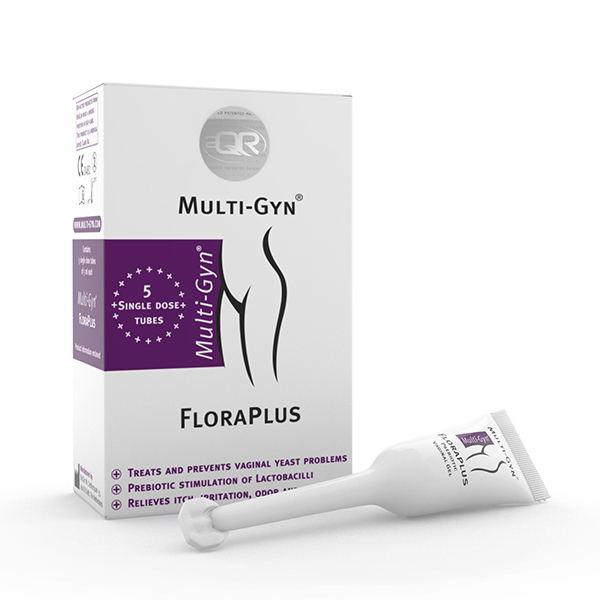 Can I use Multi-Gyn FloraPlus to prevent a recurring yeast infection/thrush? Yes. In fact it is developed because anti-mycotics often have the side-effect of recurring yeast infections, whereas Multi-Gyn FloraPlus will give the good bacteria a boost and doesn’t give the yeast a chance to grow.